We have been doing a bit of African-American history in our discussions at home. Being a history buff myself, I have been trying to get hold of child-friendly books on all such subjects at every book sale I go to. Here is one of the books we enjoyed reading on the topic of slavery in the American context. 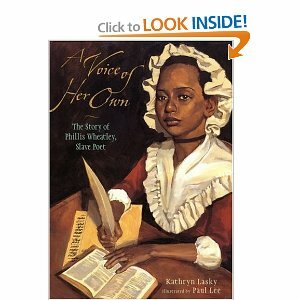 This is a biography of Phillis Wheatley, a girl born on the west coast of Africa, who was brought to the Americas and sold as a slave. Her New England owners were good people, who recognised her intelligence, and taught her to read and write. The little girl proved to be a willing and able pupil, and soon learnt all that she was taught- English, Latin, Greek, Geography, Math. She soon began to write poetry, and was published when she was just 14. It was very unusual for slaves to be able to read and write at that time, as it was against the law in most parts of the country, let alone be writing poetry and getting published! Her volume of poetry was actually attested to as authentic poetry written by a slave, by seventeen well-known white men! Phillis Wheatley was witness to some important moments in American History, and has lived through key events in the American Revolution for Independence. She also had the good fortune (!!!) to be sold as a slave in New England, which was more liberal than the South as far as slavery was concerned, and to be owned by people who treated her more like a daughter, than as a slave. In her note at the end of the book, the author, a Newberry Honor winner, has said : What slavery and every other form of oppression have in common is that they impose silence. To be voiceless is to be dehumanised. That was one of the reasons slaves were not permitted to learn to read and write. The story of Phillis is the story of a disadvantaged child, a girl slave, rising above her situation and touching great heights that most people can only dream of. It is a story of hope in the direst of situations, told in a way young people can understand, and appreciate. And as we discovered at home, can be used to broach bigger topics. The illustrations are worth a mention, full page, sometimes double page, in muted tones, and taking us pictorially through what could have become 'something only grown-ups can understand'. Phillis' poetry is typical of the period in which she lived, with religion as its mainstay, and with both her African memories and American reality potrayed in it. It also reflects the beliefs she learnt during her education. Here is just one example. May be refin'd and join th'angelic train. Sandhya, just the review brought a lump in my throat. The sample poem is so humble yet so powerful. I will try to find this book for myself. Thanks! "It seemed to Phillis she was halfway between two worlds". True words. This book would echo with many voiceless people in India as well. And I wish more books are written like this in Indian context. Thank you, Meera and Satish. I hope to review more such books. I hope to find more such books in the Indian context, too. There is so much that can be said. Very powerful and so true. It is a good idea to introduce these ideas to the kids when they are young while they can see the unfairness of it very easily and want to do something about it rather than be cynical. 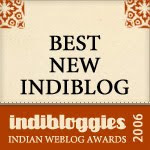 @Sathish: Maybe our collective wishing will bear fruit some day..
Great review, Sandhya!Shall keep an eye out for this book. And as you said, I look forward to finding books like this in the Indian context too. That sample poem made me sad, though.. did she really need 'saving'? The tone suggests that she was happy to lose a part of her identity in order to belong, even if only to that half world.